1)Initially rugby balls were plum-shaped and made of pigs’ bladders. As rubber inner tubes became more prevalent at the end of the 19th century, Rugby School requested that their balls remain asymmetric to distinguish them from footballs. Over time, the oval shape has become even more pronounced, making them easier to catch, hold and run with. 2)Richard Lindon was instrumental in the design of the modern-day rugby ball, but his poor old wife had to inflate them by lung power and paid the ultimate price after breathing in the air from one too many diseased urine sacks. She fell ill with lung disease, and subsequently passed away. 3)Dolway Bell Walkington wore a monocle but removed it when required to make a tackle. He played in the first Irish win over England in 1887. He scores Ireland's first drop goal against wales. 4)The tradition of singing National Anthems before an international started with rugby. Everyone knows the All Blacks dance the haka before the start of a match. But on the 16th November 1905 in Cardiff, the Welsh responded to the traditional war-dance by breaking into song. They sang ‘Hen Wlad Fy Nhadau’ in return. Nowadays, of course, it’s done at the beginning of most international sporting events, as well on receiving medals and prizes. 5)Idi Amin (King of Scotland) was a keen rugby player in the British Army. He was a good player but rather thick, instructions were conveyed in words of one letter. 6)The same whistle has been used for the first game of the World Cup . 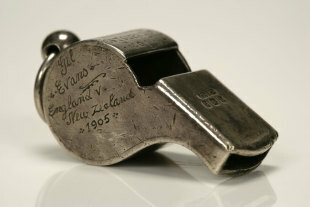 It’s known as the Gil Evans whistle, named after the Welsh ref to first use it in 1905 (England v NZ). 7)To keep players in peak physical condition in the off-season, James Naismith invented basketball as the perfect indoor activity. Naismith was a versatile athlete, and used his experience in football, lacrosse, hockey, baseball, and of course rugby, to develop the new sport of basketball. He played rugby for McGill Uni. 8)Members of the Oakland/University of Pittsburgh team were banned for 8 years because they used human heads in the warm up to intimidate opponents. In other fixtures Cromwell's head was kicked around Westminster Hall and the men of Cheshire practised drop goals with the heads of Danes after a victory. 9)Prince Charles' nose was broken by a bully in a scrum during a house game at Gordonstoun. Apparently he was hit so hard his ears flew out at right angles to his head. He vowed to get him back when he became King. 10) Rugby School's first rugby players wore bow ties as part of the ..er.. strip. It was an ordinary shirt, bow tie, vest over shirt , and heavy duty boots. Early games had huge numbers of players and were often unequal e.g. in 1835 Rugby School House 75 players, the rest 225 players. In 1840 teams were limited to 20 players – 17 forwards and 3 full backs.